ToppaPomppa is a plump and covering winter coat. Its waterproof outer fabric, soft teddy lining and well-insulating wadding will keep your dog warm even when the temperature is freezing. 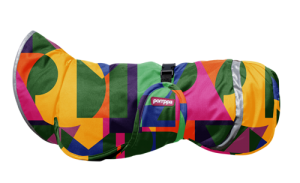 ToppaPomppa is designed to cover the entire dog. Soft materials, a generous sizing and a large rear panel ensure that your dog will stay warm also during breaks and waiting in the car. In addition to a teddy lining, ToppaPomppa is filled with a fluffy wadding. The wadding acts as an insulator against the cold air and makes Toppa an exceptionally warm coat. The sizing of ToppaPomppa is generous compared to PerusPomppa. If your dog’s back length is between sizes, choose the smaller size when buying a ToppaPomppa. 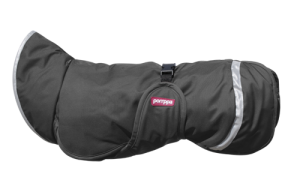 A more generous sizing compared to other Pomppa jackets as well as a large, well-fitting rear panel will help protect the entire dog against cold temperatures.